I thoroughly enjoy roasted tomatoes. Like many vegetables or fruits, when roasted or grilled, their flavors become much more pronounced. 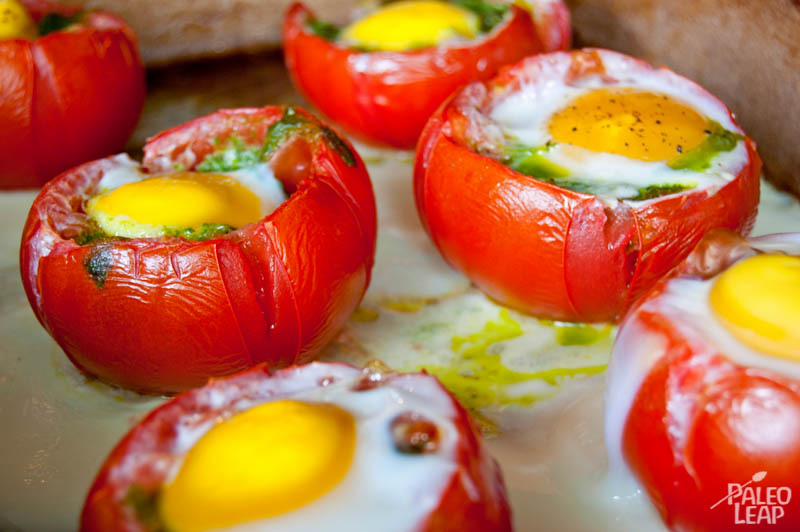 In the case of tomatoes, they also become much richer in the antioxidant lycopene when they are cooked. I needed a recipe that would differ from your traditional tomato with olive oil and garlic roast. Essentially, this meant that I would need to choose more great ingredients to cook with. I rarely cook eggs in the oven, so that in itself was intriguing enough for me to give this recipe a shot. Also, we all know how the flavor of tomatoes blend especially well with eggs as well as pesto, so I knew I could not go wrong. For those with digestive issues, it’s good to remember that some people might be sensible to eggs, especially egg whites, as well as tomatoes, since they are in the nightshade family of vegetables. The recipe is quite easy to prepare, but I did run into some minor challenges along the way. Prior to stuffing the tomatoes, you should slice the bottom tip off the tomatoes, this way, they won’t roll around. 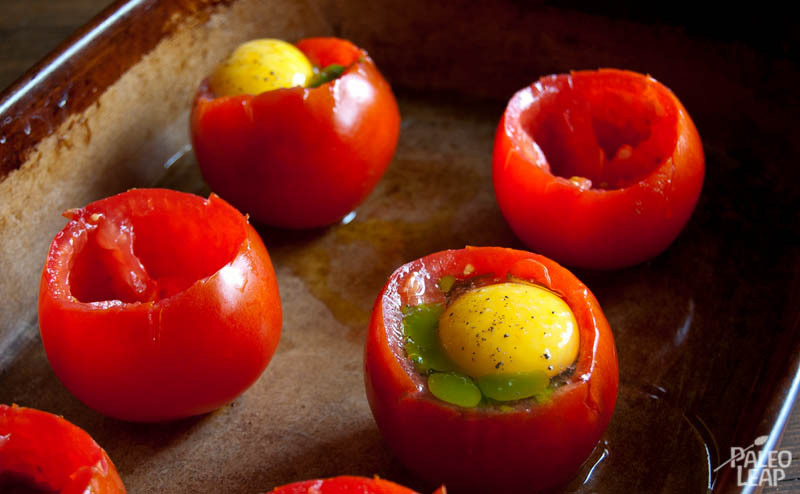 Also, you may not have to make use of all the pesto, as you want to make sure there is enough room for the egg inside each tomatoes. Finally, be prepared for overflow! A large portion of the egg whites ended up on the bottom of the baking sheet. Do not be concerned though, there was certainly enough egg in each bite! The simple pesto used in this recipe is different than the traditional pesto in the use of lettuce and parsley instead of basil and in the fact that no nuts are used. It makes for a pesto that’s very quick to prepare and that doesn’t call for any expensive or hard to find ingredients. The only piece of equipment that’ll be needed to prepare the pesto is a blender or a food processor. Remove the core of tomatoes by cutting out a large cone from the top of each one with a paring knife. Using a spoon, remove all the pulp and seeds. Season with additional salt and pepper to taste, place in the preheated oven and allow to bake for approximately 20 minutes.